Julian Worricker takes your calls on charities. Have we given up on giving? Are charitable donations down? On Call You&Yours tomorrow we're asking, Have we given up on giving? Christmas is the season for giving and is often the big year-end push for many charities. But according to a report compiled by the Charities Aid Foundation and the National Council for Voluntary Organisations charitable donations have fallen by 20% in real terms in the past year, with £1.7bn less being given. 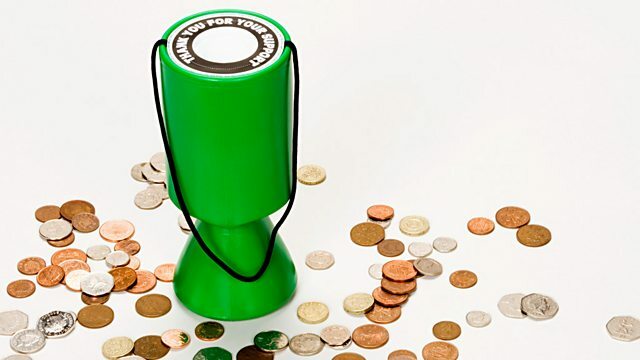 The number of people donating fell - as did the amounts they gave, from an average of £11 to £10 a month and one in six charities may have to close next year because of falling donations and public spending cuts. On Call You and Yours, we want to hear your views. Are you still giving to charity or have you cut back. Perhaps you are still giving but giving less? Or perhaps you have given more this year. Maybe you think charity begins at home and it's not your problem? Call us too if you believe that charities play an essential role in our society as they provide care to some of the most vulnerable people in our communities. Maybe you've had to turn to charity for help this year for the first time? What has that been like? 03700 100 444 is the phone number to call or you can e-mail via the Radio 4 website or text us on 84844. Join me at four minutes past twelve tomorrow.